"He had everything and wanted nothing. He learned that he had nothing and wanted everything. He saved the world and then it shattered... The pathway to salvation is as narrow and as difficult to walk as a razor's edge." 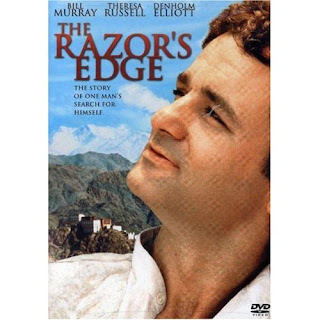 Based upon W. Somerset Maugham's 1942 novel, Bill Murray's THE RAZOR'S EDGE is the second motion picture to be based upon this classic piece of literature. It is surprisingly good. 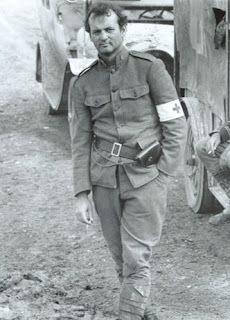 Murray plays Larry Darrell, a spoiled upper-class college graduate from a small school in Illinois who volunteers to be an ambulance driver in World War I. Unfortunately, Larry was not prepared for what he experiences on the front line -- war, he discovers, is not the "fun and adventure" he was seeking. In fact, his world changes forever, especially after the loss of his immediate commander who died saving Larry's life in a bomb crater somewhere in "no man's land." When Larry returns to the United States he is a changed man. The shallow and hedonistic parties, the banal banter and the meaningless white collar jobs all seem more trivial than before. For Larry, the silver spoon may provide status, but it also brings a life that is sterile, stifling and stagnant. In his quest to find some meaning in his life Larry first travels to Paris where he works a variety of jobs, including a stint as a coal miner. His evenings are spent living a Bohemian lifestyle and reading as many books on philosophy and religion as he can in a desperate search for the meaning of life. It isn't until he saves the life of a fellow miner that Larry is given a new direction. All these books on the wall, he's told by the surprisingly wise old man, won't give you the answers you seek, "You may read, but you don't know so much...you really don't know anything do you? First read 'The Upanishads'...but to get anything out of it you must also journey to India." 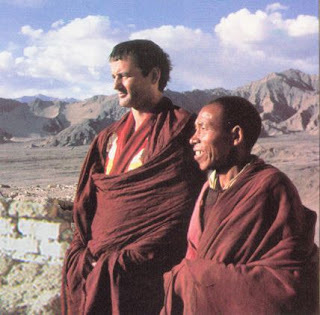 And so Larry is off to India, where he is initially exposed to the Hindu religion, and then he is directed to a Tibetan monastery where he works as a cook for the Buddhist monks. Larry eventually comes back to Paris, a changed man yet again, only to find that Isabel (Catherine Hicks), his status-obsessed, materialistic fiancee, is now married to his best friend. He really doesn't care -- in fact, Larry really doesn't care about anything until he reunites with Sophie (Theresa Russell), now a drug-addicted, alcoholic prostitute who he deeply falls in love with. Don't expect a happy ending -- Maugham's belief that "nothing really makes a difference" simply won't allow one. Murray's performance is nicely nuanced and surprisingly restrained. This was a film he desperately wanted to do, and only after agreeing to appear in GHOSTBUSTERS that same year (1984) did he get the studio funding he needed. Catherine Hicks is excellent as Larry's fiancee, but it is the brilliant performance of Theresa Russell that one will remember for a long, long time. Her scenes in the hospital after learning of the death of her husband and young son in a car crash are as raw and powerful as any you will see in American cinema. The Tagline for this film declares it to be "The story of one man's search for himself." That's true, but THE RAZOR'S EDGE is more than simply a tale of self-discovery. It is also a thought-provoking examination of the differences between Knowledge and Wisdom -- between a wealthy person's and a poor person's notion of education, i.e. books vs. experience. This is heady stuff and it is presented in a very subtle manner. In one memorable scene Larry says to Isabel, "You. Just. Don't. Get It." I suspect the same will be true for many viewers. Thanks for a thoughtful and insightful review. Murray does very well in the Larry role, although he might come across, at first, as somewhat miscast. That might be because I remember Tyrone Power in the role in the previous film version of the book. Murray brings a 1970s hippie tone to Tyrone Power's 1940s tone in the previous version. since then--including memorable roles in "Straight Time," "Bad Timing," "Insignificance," (as the 'Marilyn Monroe' character who, inter alia, discusses relativity theory with the 'Albert Einstein' character--what a hoot)"Eureka!," "Whore." "A Woman's Guide to Adultery," "The Flight of the Dove," "The Proposition," (with a love-making scene that is an hommage the famous similar scene in "Don't Look Now" directed by Nicholas Roeg her, then, husband (now divorced)). Even when the material or direction is not stellar, she manages to turn in a creditable performance. She's certainly one of the most underappreciated stars in the business and deserves better recognition and more major roles. Thanks for spotlighting one of my favorite actresses.